What, who, and how is drawn (in) to and by (p)articular moralization processes? How do held and carried moralities motivate and magnetize our movement(s) in (p)articular directions? This project was launched in February 12, 2018 with artists invited to make new work around, about, through and as "moral" considerations and motivations. A Broadsheet (see image) of materials by the involved artists supplements the 3 days of performances, talks, and presentations. 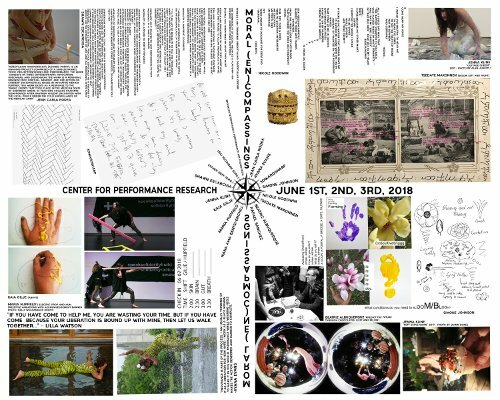 For this 3-day exhibition of interdisciplinary performance, 13 artists are invited to realize work which structurally and poetically researches their "moralities" and how morals relate to/within their practices. These artists are invited to consider the forms of their processes, interactions and interfacings with audience members/participants/collaborators, and to design relevant modes of production and collaboration. All participants in Moral (En)Compassing will also be invited to critically respond to performance art's fraught history with being judged "morally wrong," despotic, deviant. How are we (im)moral(izing) and/or deemed (im)moral? Artists are often forced to confront this question when faced with censorship, exclusion, and kyriarchal valuation schemas. Here, we attempt to deal with "morality" consciously, anterior to and (ideally/idealistically?) without (and never without) its ways of pushing and pulling, dividing and connecting, inscribing stances and directing movement, compelling and repelling, drawing us and drawn from within us?